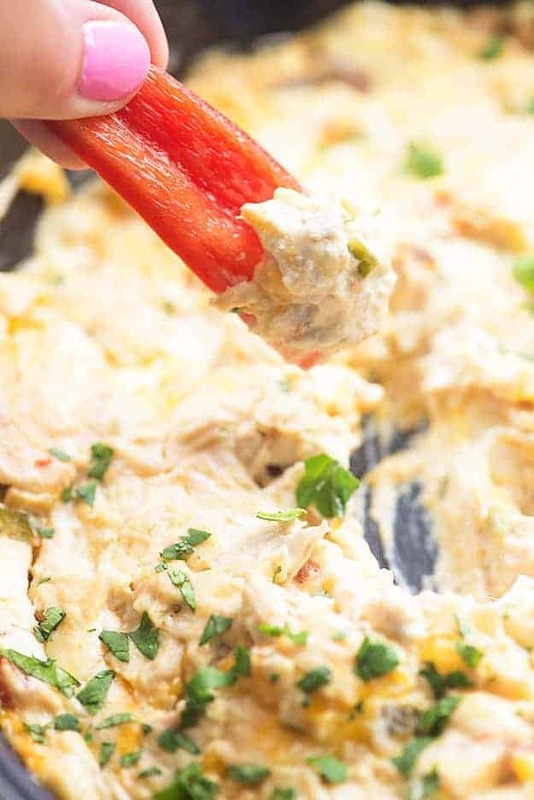 This spicy chicken dip recipe is full of salsa, jalapenos, and juicy chicken. This is the perfect football food! We’re back from our trip to Destin, Florida and while it’s always nice to be home, I’m not sure I was ready to leave. You guys. Have you ever been to Destin? 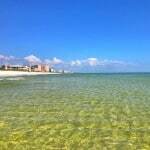 They call it the Emerald Coast for a reason. The water is crystal clear and has this gorgeous green tint to it. White, soft sand. Absolutely lovely. I mean, look. When I come home from vacation, I need a few days before I start worrying about whether or not my clothes still fit. I need comfort food. I need something to ease the transition from ‘laying on the beach drinking margaritas in the sun’ to ‘picking my husband’s dirty socks up off the bedroom floor and cleaning our toilets.’ Ya know? 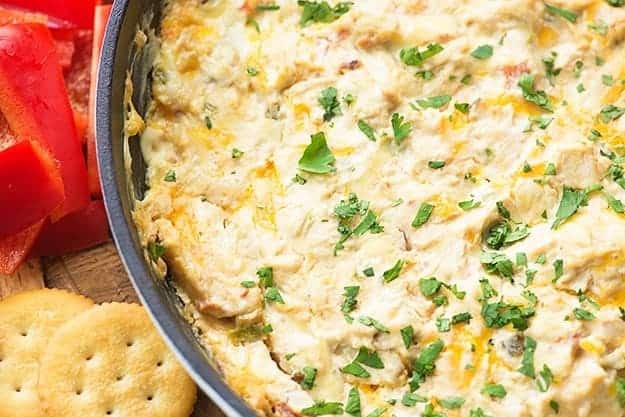 This spicy chicken dip is super creamy and cheesy. I loaded it up with salsa, jalapenos, and plenty of cream cheese. Cream cheese runs through my veins, you know. You can totally mix this up and make it more or less spicy by starting with a jarred salsa with the heat level you prefer. Then go ahead and add more or less jalapenos to suit your taste. 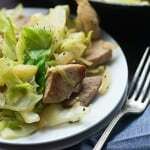 If you don’t want any spice, but do want some added flavor, the little jars of mild green diced chiles are perfect here. Also, you could totally skip the jar of salsa and use my restaurant style salsa. It is THE BEST salsa, in my opinion, and I am a salsa connoisseur. Plus it’s just about the easiest thing in the world to make. Try it!! If you like spicy snacks, try my firecrackers recipe. So fun and perfect for munching. 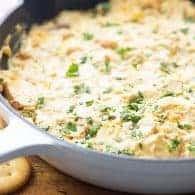 Cheesy chicken dip with a little kick! Preheat oven to 350 degrees. Spray an 8x8 dish with non-stick spray. Add everything but the cilantro to a mixing bowl and stir well to combine. Spread into prepared baking dish and bake uncovered for 15 minutes. Sprinkle the top with the cilantro before serving. 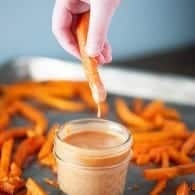 Serve with crackers, bread, or raw vegetables for dipping. Dip will always have a special place in my heart. 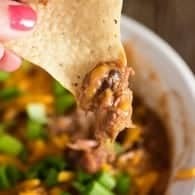 Dip as a meal? I think I might have to marry you. Can’t wait to hear more about your trip — Destin is one of my favorite places in the world! Oh my gosh. This would definitely ease the transition from vacation to real life. YUM! This is my next party dish! Yum! Love all the jalapeno!! 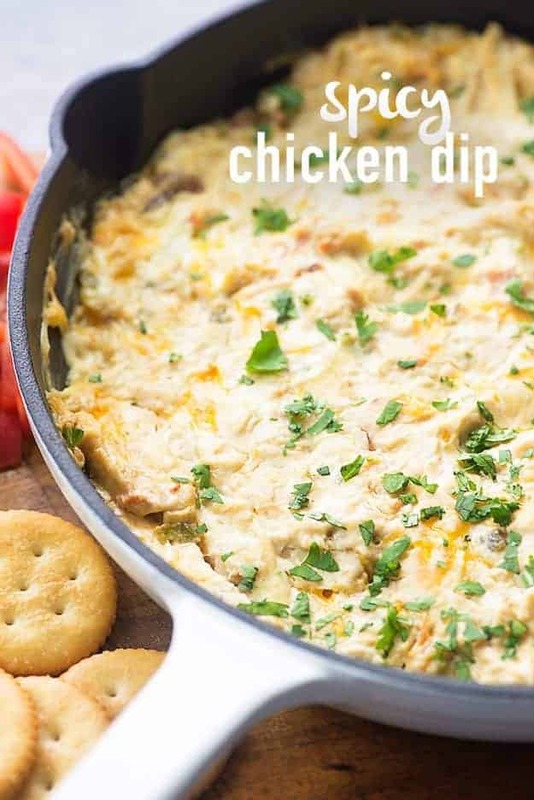 This dip sounds absolutely amazing – I love spicy chicken! Dip for lunch?I like the way you think! And yes to jalapeños-can’t live without ’em. Wow I know this must taste fantastic. All my favorite food groups!!! I need to invite someone over so I can serve this – with crackers or crusty bread, it must be terrific! Looks amazing!!! Can’t wait to try it. Oh this so yummy and delicious too, Thanks for sharing!!! This looks amazing, and I got to try making it.